Mallard Creek Barbecue | "If you like our barbecue, you'll LOVE our Church!" The 89th Annual Mallard Creek Barbecue is less than 2 months away! Are you ready? September is here and how many have already thought that it’s almost barbecue time! The days are getting cooler and the leaves are beginning to change color. Fall is coming and so is our biggest event here at Mallard Creek Presbyterian Church. The date this year is Thursday, October 25. Remember, it is always the 4th Thursday in October. We have a lot to do in the next few weeks to get ready for the big day. You will be seeing and hearing about the many opportunities that are available as we get started. There will be wood to cut, cleaning up around the Community House, cooking the meat and Brunswick stew plus a lot more. Don’t wait to be asked – ask what you can do – the “Q” needs “U”! There are so many “jobs” that have to be done around Barbecue time that they are too numerous to mention here. Over the next few weeks, there will more information coming out about when, where and what. Check on those last few vacation days you saved and mark down when you will be able to help out. 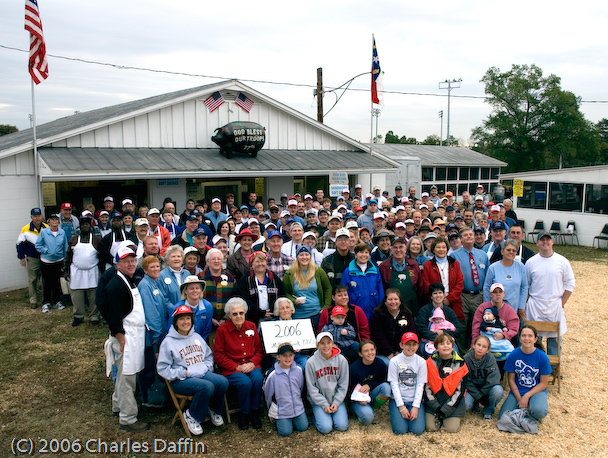 Contact any of the Barbecue committee members about anything – we do not turn down volunteer help! The 89th Annual Mallard Creek Barbecue is coming. Be sure you’re there! We are ready for customers as early as 9:30 AM until around 5:30 – 6:00 PM. Since this is an all day event, we can not guarantee how late in the day we will still have Brunswick stew available. Don’t forget the group photo… at 8:15AM. Please come and be part of the big photo. 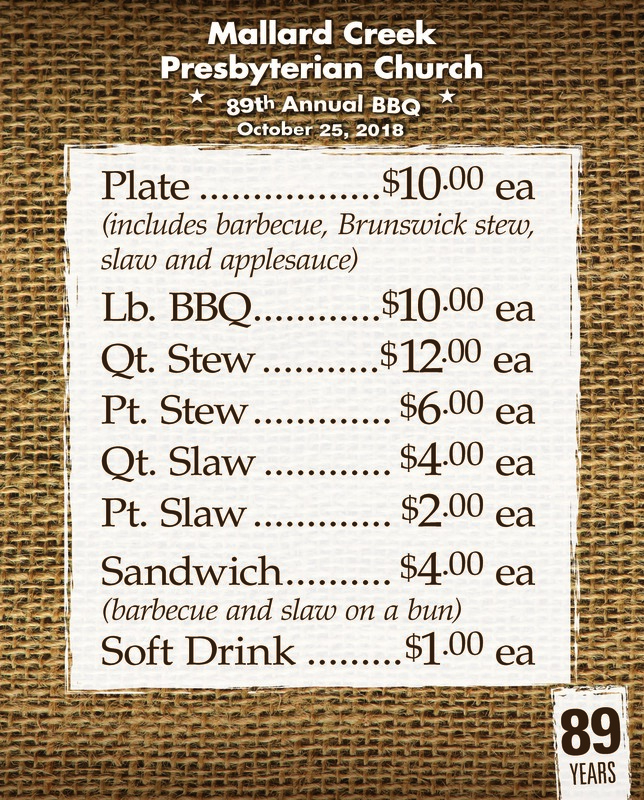 It is only August but you can be sure that members of the Mallard Creek Presbyterian Church BBQ committee are already getting ready for our 89th year on Thursday, October 25, 2018. 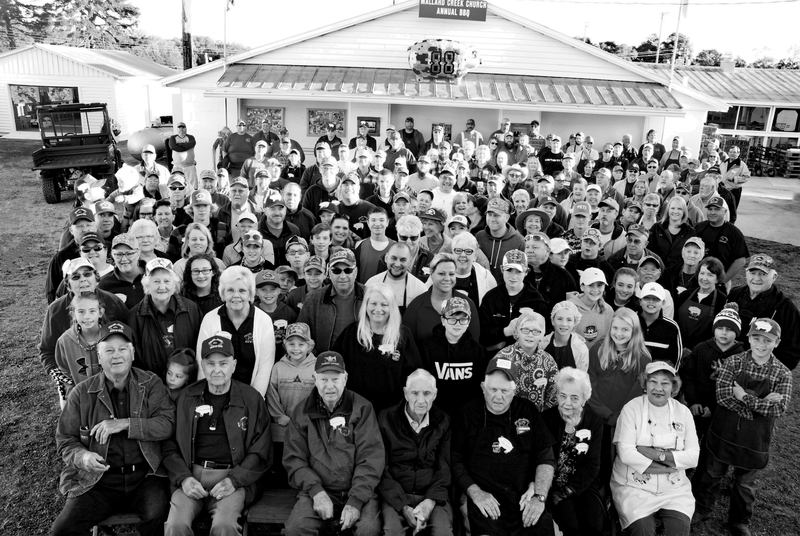 Previously, a segment aired on PBS Station 42 about the history of the annual barbeque and the many jobs and volunteers it takes to prepare and serve the amount of food that we do each year. A special THANK YOU to Jason Terzis of PBS for coming and spending time with us. We look forward to seeing all you at the Community House on the fourth Thursday of October (10-25-18) to enjoy the barbeque, stew and fellowship this fall! Please click on the link above for YouTube presentation. Some of the most venerable ladies in Mallard Creek history have worked on our serving line, creating delicious plates for folks who want to eat on the grounds and have fellowship with their food! Esther Oehler, Jackie Oehler, Ethel Ranson, the list goes on. While we do have some folks who migrate back to this line every year (including but not limited to Sharon Kimrey, Jackie Oehler if her health allows, Debbie Killian, Marlene Alexander Strong, Amber Kimrey, myself), we are always hoping to recruit other folks (men, you’re allowed to work alongside us if you like to chat!) to help serve and greet the guests. Feel free to add a comment or send me an email if you’d like to volunteer on the serving line. We love adding to our ranks (and we’re a very fun crew to work with). See you on October 23th, 2014, 9a bright and early! The Mallard Creek Barbecue Website! Welcome to the Mallard Creek Barbecue website. Our barbecue is an annual event, so mark your calendars for the 4th Thursday of October. October is fast approaching, so we wanted to get the website up-and-running. Here you will find the latest news and information about the barbecue. So please come back often, to get the latest scoop! We welcome your comments too, so be sure to write. Welcome to the Mallard Creek Barbecue Website! Thank you for taking the time to visit our website! Take a second to peek around and check out the latest news about our annual Barbecue. It is always the 4th Thursday of October, so please mark your calendars! Of course, we would love to find out what you think as well, so make sure to comment. See you around!